Paytm is offering Rs.75 Cashback on 3 months videocon recharges and Rs.50 on 1 month Recharge but this offer is Unexpectedly working on Same any amount Recharge. Within this offer you can get Flat Rs.75 Cashback on Rs.75 Recharge once (Use our Trick to Recharge upto 3 Times) and Rs.50 Cashback on Rs.60 Recharge again 3 times. Use Coupon : PAYTMVIDEOCON75 / PAYTMVIDEOCON50 [Once Per User]. Flat Rs.75 Cashback on Rs.75 Videocon D2H Recharge (100% Cashback). Once Per Number / account. 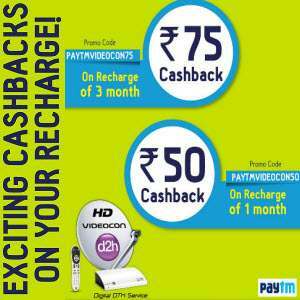 Flat Rs.50 Cashback on Rs.60 Videocon D2H Recharge. Sign up / Sign into your Paytm account. Move to DTH Recharge Section and Enter your Subscriber’s Number. Select Operator and Enter Amount Rs.60 or Rs.75. Now On the Next Page Apply Promo Code : “PAYTMVIDEOCON50 / PAYTMVIDEOCON75”. Pay The required Amount and cashback will be credited within an hour. Loot Trick Recharge upto 3 Times! Disclaimer – This trick is tested by us on 17th September 2015 and was working fine. Try it on your own Risk. If recharge fails dont worry you will get your Money back and promocode can be redeemed again!! Simply Recharge without any trick for 1-1 times (Rs.75 and Rs.60 Recharge respectively applying the promo codes). Now Transfer Rs.135 to another paytm account. Login to that paytm account and Again proceed to DTH Recharge. Again make a Rs.60 Recharge applying another Coupon and use same trick. Now for 3rd Recharge Transfer money into another account. By this you have done 3 Recharges of Rs.75 and Rs.60 !! Note – Paytm allows us to enter upto 10 digits only. So we cant put more zeros in front of the number.